Nurse jobs. 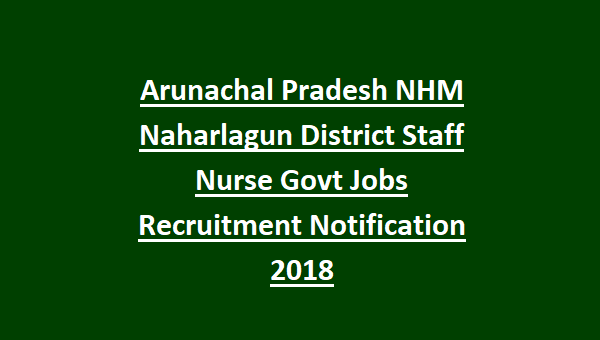 There are total 36 Staff Nurse vacancies are in this NHM Naharlagun District Recruitment 2018. Candidates selection for this NHM Naharlagun District Staff Nurse vacancies will be through skill test/written test and/or interview only. Interested candidates can prepare their application form in a plain paper and submit or drop in to the drop box available at State NCD Cell, DHS Office, Naharlagun District on or before 18-08-2018. Interview dates will be update at www.nrhmarunachal.gov.in website. NHM Naharlagun District Staff Nurse vacancies, interview date, pay scale, eligibility criteria and other details are given below. 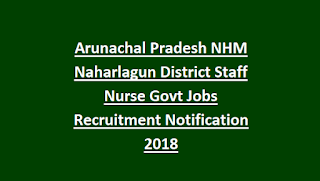 There are total 36 posts in this NHM Naharlagun District recruitment 2018. B.Sc Nursing or GNM Diploma qualified candidates are eligible to apply for this NHM Naharlagun vacancies. Candidates must have registered with Nursing Council of Arunachal Pradesh. Age limits are applicable as per NHM norms. Candidates selection is based on skill test/written test and or interview followed by certificates verification. Salary for this NHM Arunachal Pradesh Staff Nurse jobs is Rs.21000/-. Interested candidates can prepared their application form in a plain paper and attach all the required documents. Drop the filled application form along required documents to Drop Box given at State NCD Cell, DHS Office, Naharlagun before the closing date of 18-08-2018 till 04:00 PM.